Are you ready to cook because I am ready to talk about Thanksgiving! Maybe we can even chat about Christmas! Kidding, I’m a one holiday at a time sort of girl and Thanksgiving just happens to be my most favorite holiday of them all. How could you not love a day that’s dedicated to mashed potatoes, cranberry sauce, turkey and it’s perfectly acceptable to pour gravy over all of it! Don’t even get me started on how I feel about Thanksgiving dessert. So what are we going to do on this special, wonderful day of giving thanks and pumpkin pie topped with fresh whipped cream? We are headed over to my parents house and I am so excited to be cooking dinner with my mom and sister this year. Between the three of us we’ve got this Thanksgiving meal totally under control! My sister is in charge of the turkey and rumor has it nobody can cook a bird like Susie. I’m all about the desserts this year and I can’t wait to tell you which pie we loved best. Last but not least my mom is taking care of everything else in between and even though she’s assured us cranberry sauce and green beans will be on the table, my mom doesn’t usually like to be confined with cooking just the traditional sides. When it comes to cooking Thanksgiving dinner my mom is a bit of a wild card and she’ll also whip up all sorts of amazing things that she’ll think up a few days before. Seriously, this is how my mom works. One year she decided she wanted to BBQ ribs for Thanksgiving so she did and they were the best stinkin ribs ever! My mom is totally magical like that and we don’t dare question the method to her madness…I mean creativity! We just sit back and let her cook because we know we’ll happily eat whatever it is she decides to make. Can I tell you about the mashed potatoes she’ll whip up? We don’t even call them mashed potatoes, we call them party potatoes! 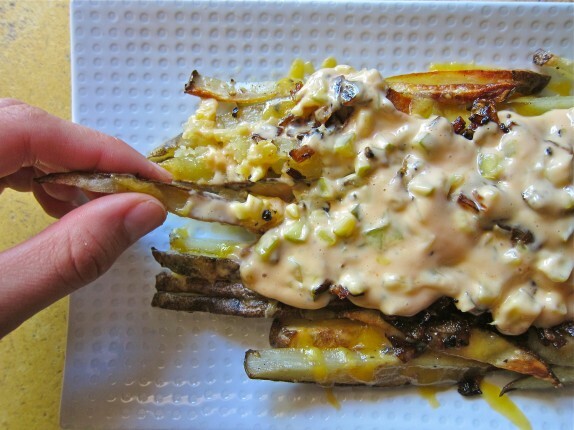 It’s a recipe my mom discovered (and tweaked to her liking) a few years ago and after the first time these decadent potatoes graced our holiday table we never went back to eating normal ones again. Cream of mushroom soup, cream cheese and cheddar cheese, I am super thankful for this wonderful potato dish. I am also thankful for my supportive, messy, hilarious family. I am thankful for our health, for the ridiculous amount of love that there is between us and I am even thankful for our fights because you only argue with the ones you love. I hope your Thanksgiving is filled with football in the front yard and plates of turkey smothered in gravy all day long! I hope you can snuggle with your loved ones to watch Home Alone for the millionth time together and I really hope you are able to sneak in a nap before your Thanksgiving day dessert! One of my favorite restaurants in Sacramento has to be Tapa the World aka Tapas. My mom introduced my dad and I to this place the night my sister had her first baby. It was an incredibly memorable dinner for a few reasons; first off the three of us were still beaming as we had just come from my sister’s delivery room and we were all so excited to welcome a new beautiful little girl into our family, secondly up until this moment it had been years since I had sat down to have dinner with both of my parents at the same table. I think I was 13 when they got a divorce and yes that was a very hard thing for my family to go through. Despite the divorce and the handful of ugly days after it, I feel like my parents never really fell out of love with each other. This is just my opinion of course and if you haven’t caught on yet I’m one of those super optimistic, glass half full types. But here’s what I’ve noticed; in all of the years that my parents have been separated they’ve never fully walked away from each other. One could argue that they’ve stayed close because of my sister and I, but I think we are just a small part of it. It seems to me that love doesn’t care if you don’t share a last name, or if you have a stack of papers with the word “Divorce” on them. If the love that two people share is real (and I believe my parent’s is) nothing will be able to keep those two people apart. Don’t get me wrong, plenty things try; pride, hurt feelings, self-centeredness, but I’m pretty sure I’ve learned more about love in my parent’s divorce than if they had stayed married. So what if their commitment to each other hasn’t always been a traditional one. The strong bond between the two of them is undeniably-there and they have an understanding of each other that only love can provide. Because of them I have learned real love is almost impossible to throw away and it is always worth the fight that love sometimes requires. Back to the dinner! The last thing I remember about that night were the garlic mushrooms my mom ordered for us. I think I might have eaten the whole dish! A person tends to do rude things like that when out to dinner with their parents but I couldn’t help it, they were incredible! Bite sized mushrooms drowning in a white wine broth and tons of fresh garlic. Pair these mushrooms with a basket full of fresh bread and you’ll have yourself a slice of garlic heaven! I’ve been ordering and eating this dish for years and I finally decided to make them myself given the fact that we no longer live around the corner from this lovely restaurant. 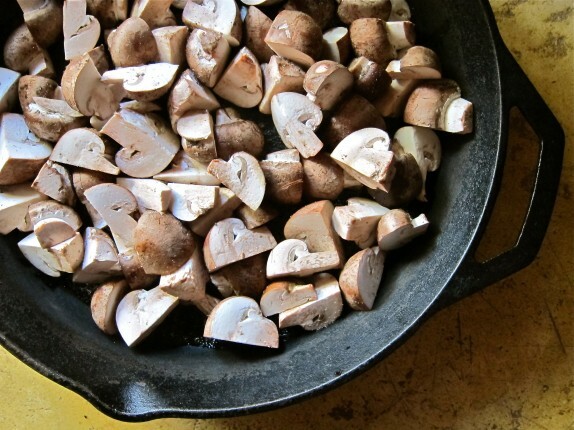 These mushrooms would make a great appetizer for Thanksgiving or a very special side dish for a weekday chicken dinner. Just make sure to eat them with someone you love, because only true love will be able to concur the kind of garlic breath these mushroom will provide! When I found out I was having a boy with my first pregnancy I’ll admit a little disappointment did set in. I thought to myself “Seriously?! What the heck am I going to do with a boy? I am a hairdresser for goodness sakes and I don’t even own a pair of tennis shoes!” The only thing I knew about little boys then is that they were loud, sticky, and their side of the Baby Gap was not nearly as exciting as the little girls side. Four boys and a closet full of flats later I have found that there is nothing I am more thankful for than being the mother to loud, sticky, endearing, incredible boys. Not that it was my choice to make but if it had been I would choose this all over again. Without them I never would have discovered what I am truly capable of. Apparently I’m really good at decoding what 4th and 5th grade girls really mean when they make fun of 4th and 5th grade boys (it means they like you, duh), and I have mastered the art of the cool but quick little boy’s haircut. When the times comes I feel like I will be a fantastic mother-in-law gracefully stepping aside, giving my daughter-in-law room to be the most important woman in my son’s life as my mother-in-law has done for me. Sometimes it can feel like a lot of important decisions in life are surprisingly not up to us to decide. But what we are in control of is how we respond to these decisions that at the time would not have been our first choice. I recently read a quote from a man named Stephen Hawking that I have been repeating to myself for the last few weeks, “Intelligence is the ability to adapt to change,” and I feel like these words hold even more weight if that change was not our choice to begin with. If we only give ourselves credit for what we are at the moment we will never know what we are really made of. As scary as the unknown is, that my friends is when the good stuff happens. 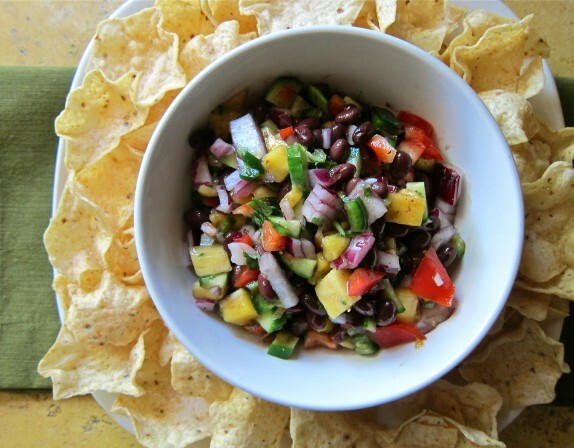 Take for example this black bean salsa. Yes it is a very yummy appetizer and it pairs nicely with some salty tortilla chips, but if that’s the only thing we give this salsa credit for then that is the only thing it will ever be. We would have never known that if you top some grilled chicken with it you now have yourself a dinner worthy to be on the cover of a magazine. You would also never realize that if you add this salsa to some mixed greens you’ll have created a beautiful, interesting salad. Just as this black beans salsa has the ability to adapt and change for the better, so do we when life forces us to change into something we never dreamed we could be. Have you ever “stalked” food before? 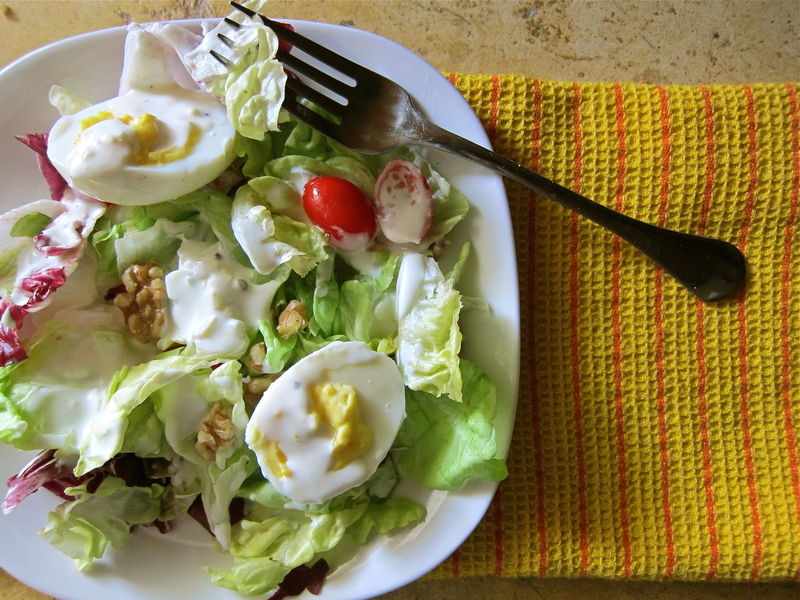 I know what you’re thinking, “What is she talking about?” I’ll explain, about a month ago a food blogger posted a picture of this deviled egg salad on her Instagram. No recipe, no list of ingredients, not even a hint as to what was in the dressing on this captivating salad. Just a fuzzy photo of delicious deviled eggs atop a bed of beautiful green butter lettuce. That’s all it took and I was hooked. I couldn’t get this amazing creation out of my mind! At the gym, deviled egg salad. Folding laundry, deviled egg salad. Brushing my teeth, deviled egg salad. I have made and eaten this salad so many times in my head I was beginning to feel like a stalker! I either needed help or I just needed to roll up my sleeves and make the gosh darn salad once and for all! I finally made it one night for our very good friends (and for their four beautiful children) and yes, it was everything I hoped it would be. The deviled eggs were creamy, the lettuce was crisp, and the garlic parmesan dressing was divine. 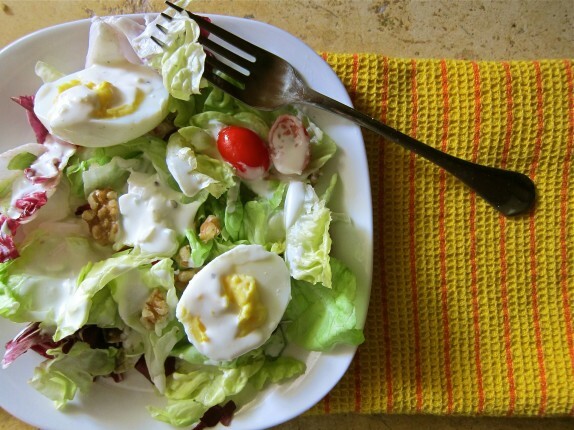 My unhealthy obsession for this salad was cured after I made it, but only for a few days. I needed to make it again soon, but I wondered if I should hold off for a special occasion. I quickly decided that a Wednesday night dinner with just the six of us was a special enough occasion for this quirky, yummy salad! Sadly my boys summer vacation is coming to an end in less than three weeks. I feel like someone has been pressing the fast forward button on our time together and our days with them is slipping through my fingers like sand. What makes this particular school season especially hard for me is that my baby will be starting preschool and leaving me completely alone for the first time in 11 years. Granted it’s only for a few short hours in the morning, still I can’t help but morn the loss of my youngest son’s babyhood. Even my husband took the news that our boys will be back in school soon hard so he decided to end their vacation with a bang. He took a week off of work, rented the biggest RV he could, and planned a trip up the California, Oregon, and Washington coast. True to my husbands sporadic nature he mentioned in passing to me that he thought an RV trip sounded like fun. “Sure!” I replied. “That would be an interesting thing to do one of these days.” Two days later the RV was booked and he was getting camp ground suggestions from friends who have camped along the Oregon and Washington coast. Like usual I didn’t have time to argue why this might not be the best idea. For starters my husband has never driven an RV, but the website does a very good job convincing a person it is just like driving a truck, totally not a problem! I’ll let you know how it goes. Also the last time we went camping was about 7 years ago and it wasn’t exactly the greatest experience. In our defense it was our first time camping with small children (1 in diapers) and we were still kind of kids ourselves! I never realized how much my mom worked on our family camping trips when my sister and I were small until that weekend. I’m pretty sure I called her to say thank you for all the years of flawless camping trips we enjoyed. Other than those two small factors I think we’ll do pretty good on this adventure, and I am glad Ryan didn’t give me a chance to talk him out of planning it. As far as I’m concerned waiting for “one of these days” to roll around just doesn’t cut it anymore. Before we know it our boys will be men with families of their own and these privileged days of the six of us sleeping under one roof will be just a very fond memory. I can’t think of a better way to enjoy their boyhood than to all cram into an RV for a week, play board games, sing silly songs, hike, and eat s’mores until our hearts content. Speaking of s’mores I’ve had a good time coming up with our RV menu. Popcorn, peanuts, M&M’s, chips, Easy Cheese, (don’t judge the Easy Cheese. 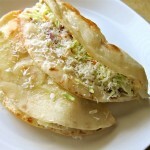 I ate it on my childhood camping trips and it was great!) Red Vines, you name it we have it as far as snacks go! As for dinners we’ll throw the usual camping classics on the grill, hamburgers, hot dogs, and my personal favorite, a couple of soy and garlic marinated steaks. I even thought a few steps ahead and pre-made a couple of dinners just in case we take a few wrong turns on a hike and end up back at our camp site later than we would like and starving. Lasagna, black bean and ham hock burritos, (I’ll share those with you soon!) 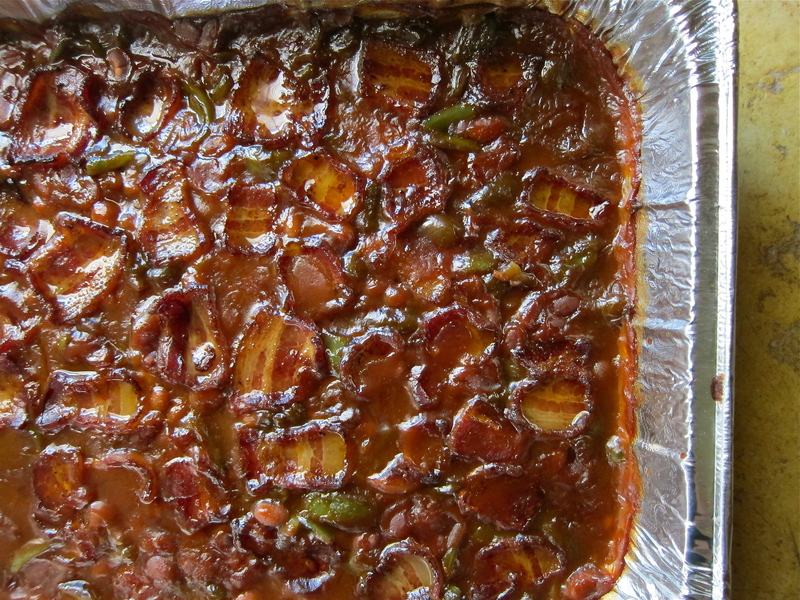 and I even threw in a side dish of BBQ baked beans. I figured the best person to go to for the perfect BBQ baked bean recipe was http://thepioneerwoman.com. 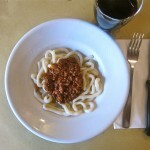 Turns out she got her recipe from another food blogger http://threemanycooks.com/! I love that food bloggers are more than happy to share their tips and techniques with everyone and that just furthers my belief that cooking is a gift that is ment to be shared. These beans are easy to prepare, full of flavor and (oh my goodness!) they have bacon on top! They will be the perfect side to hot dogs, a campfire, and a moment seized by a family whose time together already feels too short. The dark? Being alone? Saying yes? Saying no? We all have something. I have noticed that the people who are honest about their fears more often than not end up conquering them no matter the size. Those who claim to be fearless almost always end up hiding from whatever it is that haunts them, and in that processes miss out on the life that comes after overcoming a fear. Getting really, really close to people. Most of my girlfriends would tell you that I am a pretty open and honest gal. If you want to know something about me all you have to do is ask. Or if you end up sharing a bottle of wine with me I might tell you more than you’d like to know. It’s one thing to make time for your friends and family, but it is quite another thing to make some of these people not optional to you. I’m talking about not being able to live without that person. If that person were to leave, you would feel it. There would be a hole, it would hurt. Sounds kinda scary huh? I’m hoping that in my honesty about this I will someday get over it and allow myself to really share my life with the people I love. I’ll keep you posted. Calling myself a baker. For years I’ve been telling people that I do not bake. “I’m just not that into it” I would say. 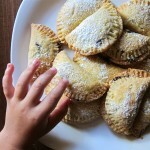 I have even boldly stated that I do not like to bake on this particular blog. Are you ready for this? I just discovered that I love to bake. Baking with yeast to be specific. I love the smell of the yeast when it hits the warm water and I love having a bowl of fully risen dough to punch down and shape up. There is nothing better than tearing into a warm loaf of bread right out of the oven and of course it feels pretty good to know you’ve made it yourself. So If I love it so much why am I afraid to call myself a baker? When a person makes such a statement people start asking you to bring the dessert to a dinner party. There is an expectation that everything that comes out of your oven is a baked good masterpiece and assume your cookies must always come out perfectly. Well not everything I bake comes out edible and please don’t ask me to bake a dessert to bring to the next get together, I’ll only end up buying ice cream. But you know what? I Melissa Vanni am a baker, with a lot to learn. 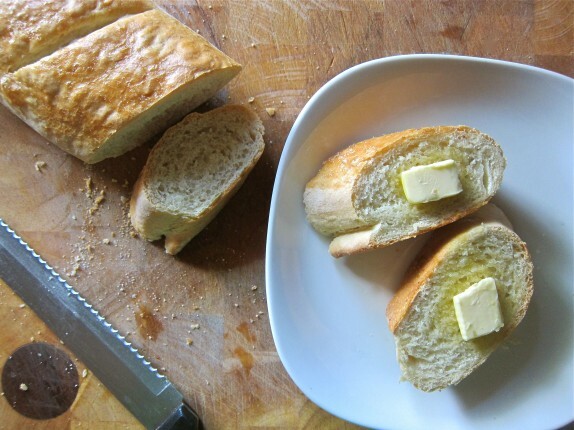 This particular loaf of french bread is so yummy and easy to make. 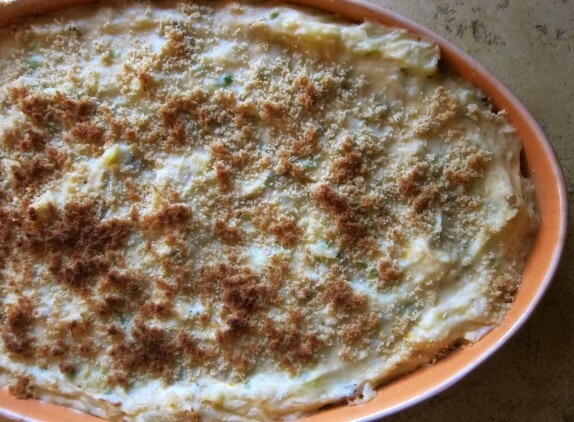 It is a very basic recipe and it comes out perfect every time. Crisp on the outside, chewy on the inside. It is wonderful right out of the oven with a bit of butter and it makes a mean french toast if you have any leftover. This bread has really help build my confidence with baking and yeast. I have also learned a good amount by making it just a few times. One fear conquered, a million to go. There is a major countdown going on in my house right now. The countdown to summer vacation. It feels like yesterday when my sister and I were patiently waiting for the last day of school to arrive and for our long lazy summer to begin. When we were old enough to be left at home alone we would fill our days with watching Nickelodeon, riding our bikes to Whitey’s and prank calling boys we liked. Those two and a half months we had off felt endless and we were always excited to go back to school. That excitement would quickly wear off the moment homework was assigned and my mental countdown to summer would begin again. As an adult I enjoy my boy’s summer vacation much more than I did my own. I now realize how fast these lazy days go by and understand how special this time together is. We sleep in, watch cartoons, make pancakes, swim and most importantly we don’t speak of homework at all. We do however have summer reading but they are books the boys have picked out and are excited to read. I know soon enough the’ll be saddled with a list of books they’ll need to read before their vacation is up. Do we have any major family vacation plans for this summer? Not really. A few weekend trips to the coast I’m sure and definitely tons of BBQ/swim parties with friends and family. Memorial day is a few days away and it always feels like the unofficial start to the pool party season. In our household my husband mans the grill and I take care of the side dishes. Buttery corn on the cob is always an easy favorite, garlic bread is great for a crowd and fruit salad is a wonderful way to enjoy all of the beautiful fruit that is in season this time of year. I however am not the biggest fan of most fruit salads. I’m not very fond of mellon so no cantaloupe or honeydew please. To avoid soggy fruit salad it needs to be served right away, and don’t even think about putting a banana in there. Gross. Because of my pickiness I came up with this crisp, color coordinated fruit salad. 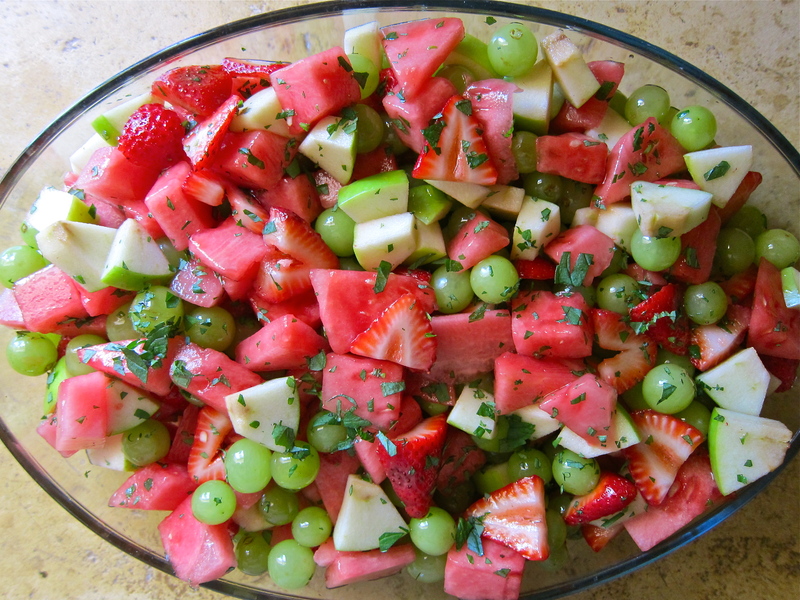 It’s perfect to serve at BBQ’s and I even jazz it up a bit with a white wine simple syrup and lots of fresh mint, because even a simple fruit salad needs to stay jazzy baby. There are a few things I absolutely can not live without. 1. Quiet mornings. It is an unspoken rule in our house to not bug mommy until I have had a cup of coffee and at least 15 minutes to wake up. People who pop out of bed in the morning ready for anything kinda creep me out. 2. A perfect pair of flip flops, and I’m pretty sure I found them this year. They are a black pair of Reefs with a thin fabric strap & surprisingly great arch support for a thinner flip flop. Not too sporty, not too girly and they look great with a sundress or pair of shorts. 3. My cast iron skillet. If my house caught on fire I would grab six things, my four boys, my dog and my cast iron skillet. Oops! Make that seven things, I can’t forget my husband! I stir fry, braise, saute, and bake almost every meal in it. It can take the heat in a oven, it doesn’t need to be scoured clean and it helps to perfectly season our omelettes. I plan on cooking with my skillet for the rest of my days, and maybe I’ll leave it to one of my future daughter-in-law’s if she’ll have the dirty ol’ thing. 4. Animal style fries from In-N-Out. If there was ever a perfect meal this is it. I didn’t think anything could beat an animal style burger until I had the fries. Caramelized onions, melted cheddar, thousand island dressing mixed with chopped dill pickles on top of a bed of crispy, salty fries. I could honestly eat them everyday, and I fight a good mental battle to not get them every time I pass an In-N-Out. I recently figured out how to make them so now all bets are off. 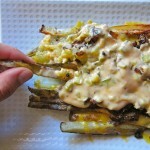 As long as I have potatoes in the pantry any time is animal style fry time. Who am I fooling? For us it’ll be more like Thursday night T.V, a skinny girl margarita (hopefully), and some p.j’s. May 5th hasn’t always been a regular ol’ school night for me, there was a point in my life when it was a super fun, gotta buy a new dress night. The summer after high school I was a hostess at a hip restaurant called Centro and at the time it was the place to be! The food was fabulous, the cocktail waitress’s were beautiful, & the hotess’s were bratty. Centro was always busy, but every Cinco de Mayo it was an absolute mad house and I loved every minute of it. We were not allowed to take any reservations, the bar was slammed from noon to midnight, there was at least a two hour wait for dinner, and the parking lot was taken over by dancing & a Mariachi band. None of the employee’s were allowed to leave early, call in sick, or even sit down that night and the next day we would all swap stories of, “Did you see that lady…?” “No, but I did see this one guy…” I’ll let you fill in the blanks. So in honor of this day I’m going to show you how to make nachos. What’s so interesting about melting cheese over tortilla chips you ask? Nothing! 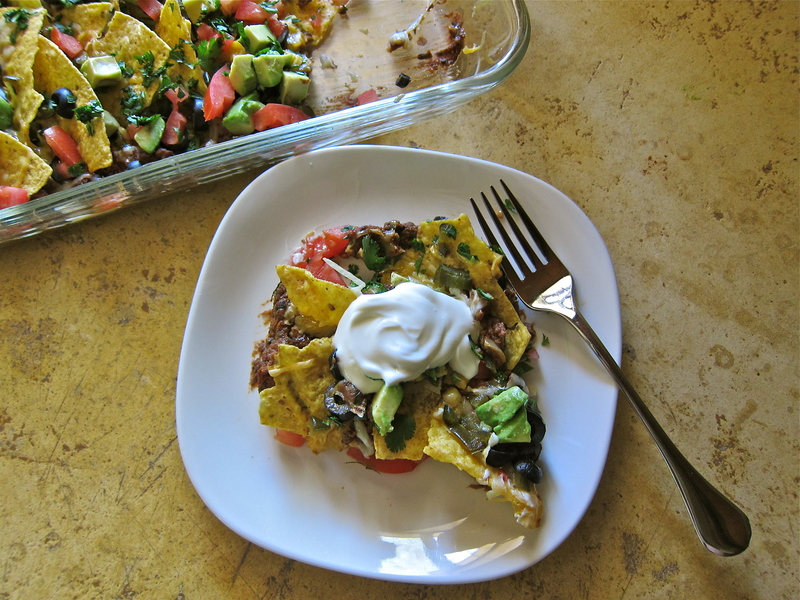 But when you involve black beans, chorizo, TWO kinds of cheeses, and a bunch of other fun toppings these nachos can help make even the most normal Thursday night Cinco de Mayo a bit more exciting. I don’t know about you but I like my side dishes to be quick, flavorful, and nutritious. This rice is packed with veggies and it’s perfect with tacos, enchiladas, or if you wanted to add some chicken it would make a great meal. 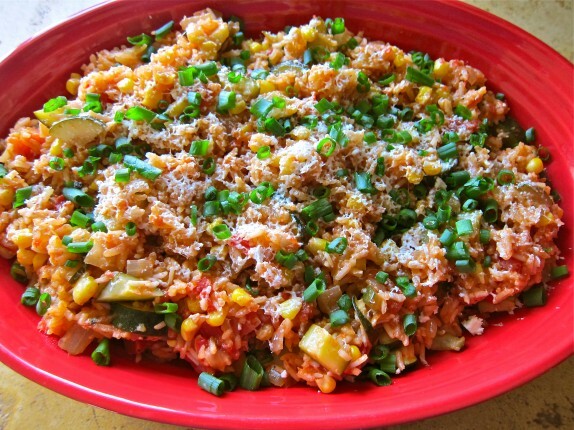 It’s also a yummy side dish to bring to a pot luck, or to a family that has just had a baby. Ahhhh, good ol’ baby meals. I loved it when my friends and family cooked for me. So much, it almost makes me want another baby. I just want people to cook for me, I’m good on the babies. Back to the rice….